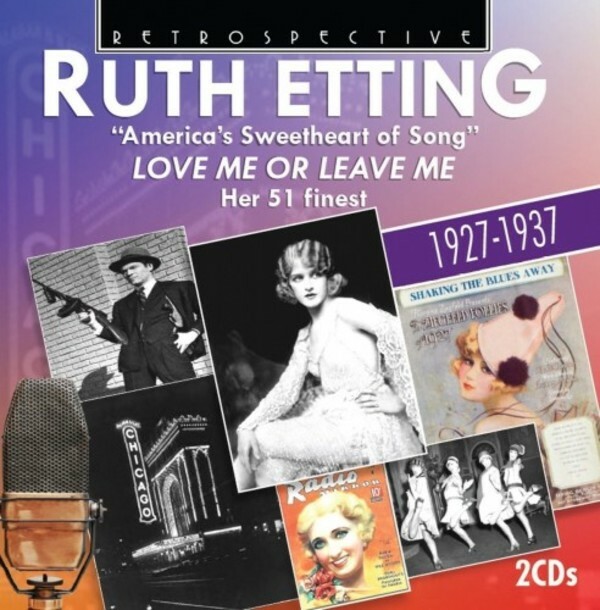 Here is the definitive 2-CD set of vintage tracks from one of the greatest stars of the 20s and 30s, Ruth Etting – for years America’s favourite female vocalist. Ruth Etting (1907-1978) was the queen of the torch singers and one of the most popular of all entertainers during the period of the late 20s and early 30s. Slim, blonde and dramatic, she was known as “America’s Sweetheart of Song”. No fewer than 62 of her recordings were hits. Her remarkable life story (she was for 15 years married to the notorious gangster “Moe the Gimp”) was depicted in the 1955 biopic Love Me Or Leave Me starring Doris Day (a special bonus track at the end of disc one presents Day’s recording of the title track). Love Me Or Leave Me is also the title of Retrospective’s generous double album of 51 inimitable Ruth Etting performances. No fewer than 37 of them were the equivalent of “chart” hits, including 13 Top Fives. Among the biggest were the poignant Ten Cents A Dance, her Ziegfeld Follies showstopper Shaking The Blues Away, and the Fred Ahlert songs I’ll Get By, Mean To Me and Life Is A Song. And she is heard giving her inimitable treatment to many of the greatest ‘standards’: Smoke Gets In Your Eyes, Close Your Eyes, I’ll Never Be The Same. This last is a prime example of her delightful ‘trademark’ of changing tempo half way through a song, as are Crying For The Carolines, Nevertheless and the irresistible It Was So Beautiful. 3 But I Do, You Know I Do! 8 Love Is Like That, What Can You Do?